In 1557, Sir Francis Drake hired Newport to capture Spanish ships and bring treasures back to England. After ten years as a privateer, Newport was chosen by King James to command three ships owned by the Virginia Company. 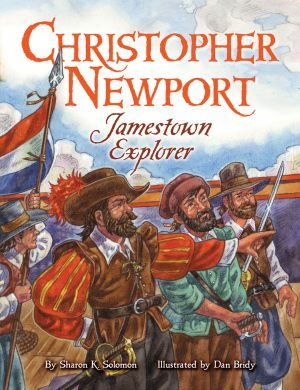 On this voyage, Newport and his crew changed the world by founding Jamestown, the first successful English-speaking colony in America. Sharon K. Solomon is a retired elementary reading specialist with more than thirty-five years of educational experience. 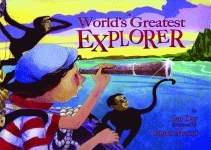 She began writing children’s books as a teacher and has continued to write a variety of children’s works. Also the author of Pelican’s Cathy Williams, Buffalo Soldier, Solomon is an active member of the Society of Children’s Book Writers and Illustrators. She resides in Lansdowne, Virginia, where she is a member of a local writing critique group. Dan Bridy is an award-winning illustrator and graphic designer whose career spans more than thirty-five years. He has worked for major design studios, advertising agencies, and the Rainbow Grinder, an art studio he co-founded. He has also illustrated children’s books, designed murals for museums, and created fine art. An avid sports fan and music aficionado, Bridy lives with his wife, Lorraine, in Pittsburgh, where he is a member of the Pittsburgh Society of Illustrators.